2017 marked the 50th anniversary of the Central Gardens Neighborhood Association. We celebrated by exploring the history of our great neighborhood with highlights from various historic records of our city. 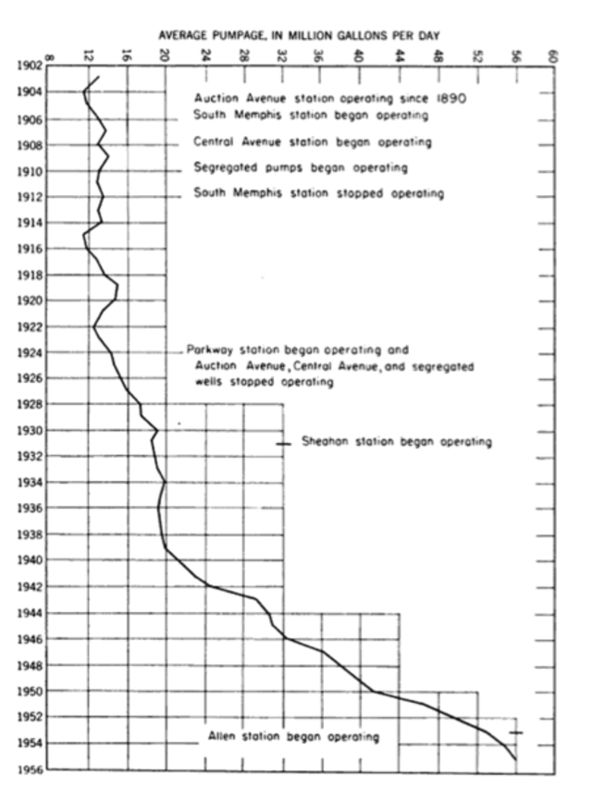 This article references the Standard History of Memphis, Tennessee: From a Study of the Original Sources by John Preston and A.R. James (published 1912) to share the beginnings of another one of Central Gardens’ more important infrastructure components – the drinking water - that combined with the sewer system propelled Memphis into the 20th century. After a yellow fever epidemic swept through Memphis, Tennessee in 1878, the newly created National Board of Health sent engineer and Civil War veteran George A. Waring Jr. to design and implement a better sewage drainage system for the city. After the epidemics had brought forth the sewer system, more water was needed for the flush tanks, house-flushes and other domestic purposes. The Memphis Water Company extended its pipes and started negotiations for the public supply of water. Water-piping increased rapidly after 1882, but the water was muddy and unsatisfactory. Three years after the completion, citizens' organized for the purpose of providing ways and means of getting cleaner water. The Legislative Council of the Memphis appointed a committee of ten to investigate water supplies in the vicinity. Lead by General Colton Greene, the committee investigated three sources of water supply: Mississippi River, Horn Lake, and Wolf River which were all higher upstream than the current water supply but would still be necessary to be filtered. Water wells had been suggested to the committee, but wells at that time were not thought feasible, especially as The Memphis Water Company had experimented with wells and reported them failures. They rejected driven wells as "impracticable for local reasons," and artesian wells because of their "uncertainty and unreliability." After much discussion of all the systems presented, this committee recommended "Wolf River, at a point above and near to the L. & N. R. R. crossing, as the proper source of supply," and they advised the adoption of the plan of the water works described by Gen. Colton Greene. In the mid-1880’s James Lee Jr. diversified his family business by adding the Bohlen-Huse Machine and Lake Ice Co. to his successful enterprises. This company became the largest ice business in Memphis under family management. 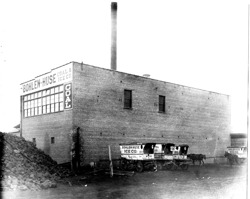 During the Bohlen-Huse early years, ice was harvested from northern lakes during the winter and barged down the Mississippi River to Memphis. The Memphis Water Company tried to find a new source of water for years, to no avail. But on March 18, 1887, while sinking a well for Richard C. Graves at the Bohlen-Huse Machine and Lake Ice Company, the drillers tapped the artesian water supply which existed underneath the city. The water was found to be pure and plentiful. Memphis had discovered its single, greatest resource, one that would do more to increase the health and development of the city and its residents than any other factor. A company was organized to supply water from wells, and after successful experiments, they were able to contract with the authorities in July 1887. This new company took the name of "The Artesian Water Company," and agreed to supply water to the city and to individuals. This interfered with the Wolf River Company, so they too sank wells. Consolidation of interests was considered and agreed upon in 1889. Soon after, the Wolf River plant closed. In 1890 a first-class pumping station was started and the Memphis water supply became one of the best supplies in the world. In the contract between the Taxing District and the Artesian Water Company, the latter contracted to furnish "good, clean, pure and wholesome water of the character examined and approved" by the board of inspectors, from wells about 400 feet below the level of Court Square. They also contracted to furnish water for fire hydrants, flush-tanks, dumping stations, public municipal offices, police stations, municipal hospitals, engine-houses, public fountains, sanitary stables, levee washing, flushing gutters, and public drinking fountains. 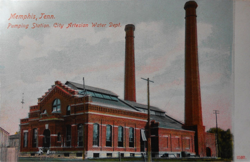 Read More about the history of our pumping stations in Memphis Water Works Pumping Stations by James K. Ingram. 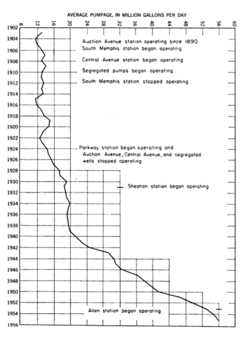 The 1880s seemed to be untangling all the problems of the two previous decades that had hampered Memphis' existence. The Board of Health reports from year to year, show improved conditions. In 1885 the city annual report stated "The year was an exceptionally healthy one. The total freedom from epidemic disease, with a lower death rate calculated upon the same estimated population, must be due, in a large measure, to the improved sanitary condition of the city, the enforcement of the health ordinances and operations of the health department. With a steadily increasing population, which is apparent and concealed, and which is attested by improvements in every part of the city, the number of deaths for the year is 193 less than for 1884, and only 81 in excess of 1883. This, I think, the public health of the city." Today, the water we use for drinking, cooking, recreation, and industry comes from that same underground aquifer. 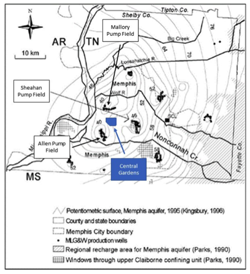 Known as the Memphis Aquifer, it is a natural underground reservoir located from 350 to 1,100 feet below ground surface. It is a part of a larger system of aquifers extending to a depth of 2,600 feet. The aquifers are composed of layers of clay, sand, and gravel that act as a natural filter to remove many impurities from the water, which is contained within the sands. More than 180 wells have been drilled into the Memphis Aquafer to supply drinking water for people of the area. Ground water from the Memphis Aquifer is considered to be some of the best in the country. In 2016, as part of a multiyear effort, MLGW earmarked $6.1 million for work at five treatment facilities, an increase of $2.7 million, or nearly 80 percent, from the $3.4 million budgeted in 2015 for maintenance. The largest chunk, $2.6 million, is being spent at the 92-year-old Mallory Pumping Station at Dunlap and North Parkway, where equipment ranging from valves and control systems to filter media will be replaced. The Sheahan Pumping Station by the U of M is the station that supplies Central Gardens. This is one of MLGW’s oldest. It was built in the 1930s on an old plantation. (The plantation house and barn are still adjacent to the pumping station, but they have been modernized considerably.) Sheahan has three separate buildings—one for pumping, one for aeration, and another for filtering.